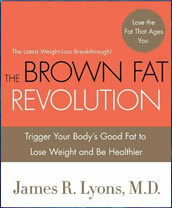 The Brown Fat Revolution: Trigger Your Body’s Good Fat to Lose Weight and Be Healthier is written by James Lyons, MD., a plastic surgeon and former clinical instructor at Yale University. In this book he reveals that not all of the fat in our bodies has a negative effect and in fact, a certain type of fat, called brown fat is actually healthy for us. Brown fat increases the rate at which we burn fat and it is found in very high amounts in newborns that use it to regulate their body temperature and keep warm. Gradually a higher proportion of yellow fat replaces the brown fat as we age. Yellow fat is the kind of fat we typically think of when we refer to body fat. It acts as storage for excess calories and has a softer consistency than brown fat, which is quite firm and resilient. The Brown Fat Revolution also says that having enough brown fat is the key to a beautiful looking face and that abundance of yellow fat and a lack of brown fat is the reason why women’s faces change shape as they age. Studies also suggest that activating our brown fat may be an important key to help us lose weight and staying healthy. The first part of the book concentrates on the science of brown fat and explains how the replacement of brown fat with yellow fat can lead to changes in appearance, such as flabby thighs and wrinkles. Lyons also goes into the hormonal changes that occur in women as they age and how this affects the balance between brown and yellow fat. In the diet section of the book Lyons recommends an eating plan where you alternate between carbohydrates and proteins. He says that this helps to reduce appetite, regulate blood sugar and hinder the production of fat. Lyons attempts to dispel the myth that eating fat will make you fat and he encourages dieters to ensure an adequate intake of healthy fats. Dieters eat six small meals every day and should always consume a meal both before and after exercise. Apparently this will help to “keep your metabolism on an even keel,” and will assist with the replacement of yellow fat with brown fat. The Brown Fat Revolution includes a four-week meal plan that provides options for vegetarian and vegan dieters. Fruit, vegetables, whole grains, legumes, nuts, seeds, chicken breast, fish, non-fat yogurt, olive oil. Exercise is an important element of The Brown Fat Diet and separate programs are provided for those aged between thirty to fifty years old and those over the age of fifty. The routines emphasize strength training rather than aerobic activities and focuses on weight training, resistance bands and developing core strength. The book includes photos of the exercises and outlines a detailed four-week exercise regime. The Brown Fat Revolution: Trigger Your Body’s Good Fat to Lose Weight and Be Healthier retails at $24.99. Specifically targeted towards women over thirty. Encourages the intake of healthy fats and low glycemic carbohydrates. Includes vegetarian and vegan options. Encourages healthy weight loss expectations. Not all experts agree that activating brown fat will lead to weight loss. Diet is very similar to most other high protein, reduced carbohydrate diets. Does not encourage cardiovascular exercise. May not appeal to men and younger women. The Brown Fat Revolution is aimed to help dieters to develop a higher proportion of brown fat, which has been linked to an increased metabolism and reduced body weight. However, the claims made by Lyons for the efficacy of his program and beneficial health effects of brown fat are yet to be adequately substantiated. While dieters may lose weight by following The Brown Fat Diet, it will probably not be primarily due to changes in the composition of fat and is more likely to be related to improving the quality of the diet and engaging in regular exercise.